One thing that every business app eventually needs is an ability to search for something and show results using paging. The reason for that is that too many rows in search result set can bring any application to its knees. Hence, you should always page search results. If you are building a web application, there is always a temptation to use a data grid control to show those results. If you are using Angular, you can use ngGrid. I, however, do not feel that data grid is a good idea for web applications designed to run on any device, including smart phones. A grid with even four columns, such as First Name, Last Name, Edit button and Delete button will now look very good on the phone. On top of that, it is not going to be very usable because the text is going to be small and button are not going to present large enough targets for touch. Hence, I am not going to use a data grid, but instead I will present search results in Google search style. So, I am going to demonstrate in this post how to solve this problem to come up with the following solution. I took this screenshot use pretty small browser window, about the size of a phone. It looks just as well on a large screen. So, I presenting the results in a “well”, showing last and first name in line with two buttons, to edit and delete below. I have real mad design skills, don’t I? OK, now let’s talk about solution. First, let’s take a look at the view behind this screen. 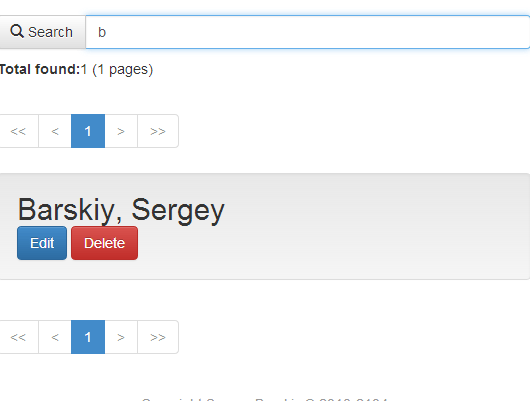 It is quite simple, using just a few Twitter Bootstrap styles. What you see above is search input box. The user can type in part of last or first name. The button is using glyph icons that ship with bootstrap. The search results will be shown using ngRepeat directive. This is where I have my “well” with placeholders for my data – last and first name. All this is pretty easy, right? OK, enough with C#. Let’s take a look at the Angular code. There are two main players there – controller and a directive. Controller does just a few things, it calls service component to get the data and just sets up totals and result set properties. Total of about 10 lines of code. I wrote it in TypeScript, but you can look in my download to find compile JS version of all the files as well. See, I was not kidding – very little code here. You can see that in my search function I just call my Angular service custom component that simplifies the Api for me a bit, so that I do not have to write .success and .error all the time. After the call is done, I check Success property, then set my totals – pages and rows – and my data – contacts property. Then I broadcast an event down my scope (view model for my screen). Guess what is listening to the even call – my directive of course. My performSearch function is what my search button on the view is bound to. Name property is also on the scope, and it is bound to the search box. There are three main functions in it. handleButtonClick function is what I bind to the page buttons I create. In this function I call controller’s goToPage function, passing the page number from the button. I use scope.$eval to do that. There is a bit of code there to handle previous, next, last and first buttons as well. There is also a bit of code to handle clicks on disabled buttons. Yes, those still fire, but we can eat them. They fire because disabled is a built-in style in Bootstrap. hasPageButton is a helper function that checks to see if a specific page button exists inside pagination <ul> element. Refresh function just rebuild the page buttons. It is fired in two cases – when a user clicks on a page button or when a use performs new search. It takes a parameter to distinguish between the two. First, this function checks to see if the page you selected is listed in the list of current 5 page buttons. The reason this occurs is because the user can be looking at pages 1 through 5, but hit ‘next’ button to go to page 6. In this case I am rebuilding the page buttons, preparing for the next group. createButton helper function is what creates the UL and wires up event handler. And, finally, if there are not pages to show, I am hiding entire <ul> by calling empty() on it. There is a bit extra code to deal with lack of jQuery. Angular ships with jqLite, which is missing some functionality I need for this directive, such as full children() implementation or full find() implementation. You can download entire project here. This functionality is in Contacts screen.